Disability campaigners are furious that one of the main sponsors of the big event is a company making millions by stripping disabled people of their benefits. Alongside the publicity for the Paralympic Games in London, look out for five days of "Atos Games" from August 27. The sponsorship - as surreal and inappropriate as Hitler funding a Jewish hostel - has been publicly and arrogantly defended by the International Paralympic Committee's president, who insisted that Atos is a "top sponsor" of the London games and was "very much part of the committee." By spending as little as $10 million a year over 10 years, the company gets the right to pose as a friend and supporter of people with disabilities, even as it pockets the profits from its £100m a year contract to deny people, including potential Paralympic athletes, the benefits they should be entitled to. The sponsorship money is a drop in the ocean for Atos, a French multinational based in Bezons with an annual revenue of $8.5 billion. Atos's parent company describes itself as "an international information technology services provider." Its main practical involvement in the London Olympics is as a provider of computer technology - and annoying lanyards for volunteers and other staff. But it runs highly lucrative sidelines in Britain under the name of Atos Healthcare, with contracts both from the Department of Work and Pensions (DWP) and the National Health Service (NHS). The firm's innocuous Google listing proclaims it to be "the UK's leading occupational health service provider," while the website lists other main functions as "well-being," "employee assistance" and "disability assessment." The company was first brought into British healthcare by the Labour government, which made it preferred provider of "NHS" walk-in centres - some opened by Labour ministers - and some diagnostic services. It now boasts that it runs 150 treatment centres in England. Labour had previously employed Atos to run assessment services for the DWP, with the first contract awarded as early as 1998. The contract was then renewed as the pressure to reduce the numbers claiming disability benefits increased. Atos and its testing centres are now central to the effort to reassess 1.6m people who have been on incapacity benefit, which is now being phased out. The central task is to ensure that far fewer people are deemed eligible for the new "employment and support allowance." The tough regime established by Labour in the assessment centres has become even more brutal since 2010, with the Con-Dem coalition seeking to cut £18bn from welfare spending. 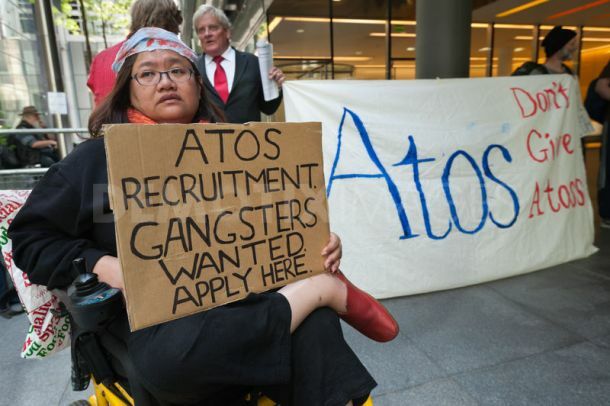 The Atos contract is now to test 11,000 sick and disabled people every week. Top British Paralympian Tanni Grey-Thompson is among those who have pointed out that the benefit cuts will affect the development of top athletes among the thousands denied support payments of up to £45 per week. Atos Healthcare's website ironically claims that "Atos Healthcare is proud to lead improvements in the way care is delivered, giving control to patients and helping them choose how to manage their health." Yet the company has been blamed by tens of thousands of disabled people, charities, GPs and MPs for doing the very opposite - wrecking the lives of people whose benefits are withdrawn after undergoing their hostile "tests," which are designed to ensure that only a tiny minority are deemed sufficiently disabled to fail the "work capability assessment" (WCA). Almost two years ago charities attacked the testing system as "not fit for purpose" and demanded changes. Last summer, the House of Commons work and pensions select committee highlighted major concerns over the WCA and said that even the mention of Atos Healthcare caused "fear and loathing" among disabled people. In April this year Paul Farmer, the chief executive of mental health charity Mind, finally resigned from the panel responsible for monitoring the work of Atos-employed doctors in administering the WCA tests. In May the British Medical Association’s GP committee annual conference voted unanimously to call for the WCA to be scrapped. And in the run-up to the Paralympics, Atos has come under increased attention with a major exposé in the Daily Mail and a devastating undercover report by Channel 4's Dispatches, in which a GP secretly recorded the training of Atos assessors, in which time and again the emphasis was on the fact that the employment and support allowance was "designed to get people off benefits" and how few people should be found eligible. Towards the end of the programme instructors admit that the company would be asked questions if more than 12 pe cent of claimants are found eligible for the allowance. The "training" is a series of exercises in discounting disability and chronic pain, and ignoring the actual circumstances of the person in front of them and the reality of the employment market. So over 1,000 people passed by Atos assessors as "fit to work" have died soon after, and many have committed suicide. Dispatches' undercover camera picks up a brutal and cynical training session. "One arm is not a problem. You only need one finger to be able to pass the manual dexterity test," says the unpleasant instructor, an east European doctor of unknown expertise whose "speciality is not recognised in this country." Cancer patients receiving oral chemotherapy have to be passed as fit for work, she says. People who can in theory move themselves in a wheelchair pass the mobility test, even if they do not possess a wheelchair and have no possibility of using one. Sight-impaired people who can distinguish a word or two of braille, hearing-impaired people who can lip-read a simple word are to be passed as fit for work. Claimants must be judged "hypothetically" fit for work, even if their level of disability means there are no actual jobs they could do in practice. And the report also shows how medical professionals prepared to abandon all of their professional ethics and work in this regime are given the fig-leaf of deniability to salve what consciences they may have, with Atos insisting that they "do not actually take the final decision," simply apply the test and leave the decision on benefits to the DWP. Even if they get it wrong, and the appeal is heard, the doctors who wrongly deprive a disabled person of benefits would not have to appear or answer for their actions. In practice 94 percent of Atos medical reports are simply rubber-stamped, regardless of advice from the claimant's GP and other doctors. Some 40 percent of decisions result in appeals and thousands of these are successful. But many claimants lack the confidence and courage to appeal against even the worst decisions, so Atos delivers the goods for ministers seeking to cut the benefit bill. One further factor not addressed by the Dispatches programme is the bias of the tests towards purely physical illness - this has a particularly harsh impact on people with mental illness, many of whom are further distressed and set back by the ordeal of the tests and the consequent loss of benefits. Disabled People Against Cuts have been campaigning hard over this barbaric system, and are now determined to make the Paralympics and its embarrassing sponsor a focus of public attention. They are planning to deliver a coffin-full of messages about Atos to the company's doorstep on August 27, a "visit" to Atos local offices on Tuesday 28, a spoof Paralympic award ceremony on August 29, a phone jam and Twitter storm against Atos on the Thursday, and a "grand finale" in London organised with UK Uncut on Friday August 31. 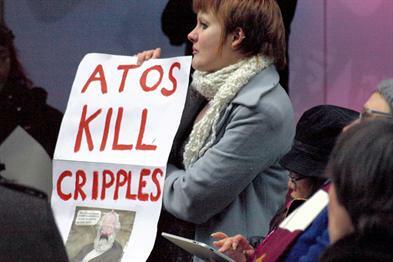 Check out more details on atosvictimsgroup.co.uk and help make sure that the Paralympics throws a sharper spotlight on the vicious attacks being waged on people with disabilities by the government, the DWP and their cynical henchmen in Atos Healthcare. *John Lister is director of Health Emergency.